You know what really works for me besides the pill boxes (and yes at times I feel like a grandma, too) is to set little reminders on my phone (I only have a cheap pay-as-you-go phone, but it does the trick). That seems to work like a charm. Glad you got a day to yourself…sometimes organizing stuff makes me feel like I’m more in control of at least something and I’m sure that had a calming effect on you, too 🙂 I hope your week will be less eventful and that you can catch a break! Lol, we have the grandma pill boxes too. We keep them on our night stands, and each night I have to remind my husband to take his, lol. 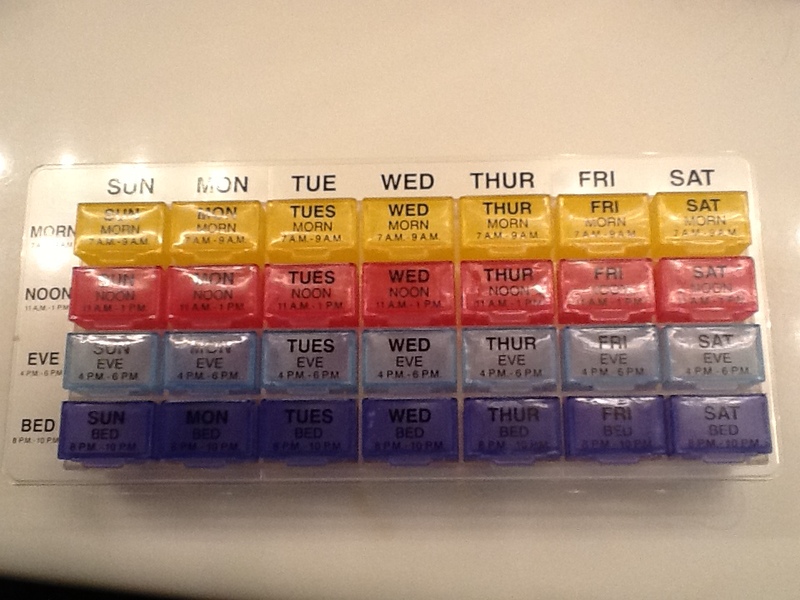 It does make it “easier” being able to see if I’ve taken my pills for the day yet. Like maeussle, I set reminders that repeat daily for my meds as well! The ones I take every morning with breakfast are easy, I already have them sorted out into dixie cups that I stack on top of each other so that I just have to take one out and down it. The pills that I have to take in the evening are the ones I am more forgetful about, so my alarm goes off every night at the same time to remind me. I am so paranoid about forgetting them now that I usually remember before the alarm even goes off! So glad you found something that works for you! I’m sorry to hear you were so down. But believe me when I say that it doesn’t make it hurt any less even if you’ve “only” had two failed IUIs. It still hurts not being able to make your dreams come true…in some ways it was more painful for me when I was at that stage than it is now…probably because I’m stronger. Hoping with all of my heart that this next step brings your baby. Hugs!